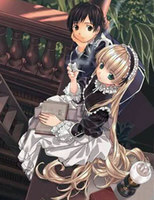 Plot Summary: GOSICK takes place in 1924 in a small, made-up European country of Sauville. The story centers on Kazuya Kujo, the third son of a Japanese Imperial soldier, who is a transfer student to St. Marguerite Academy, where urban legends and horror stories are all the rage. There he meets Victorique, a mysterious yet beautiful and brilliant girl who never comes to class and spends her days reading the entire content of the library or solving mysteries that even detectives can't solve.